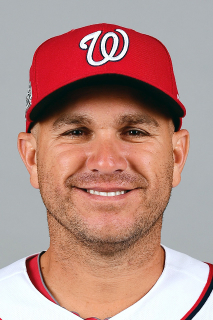 Miguel Angel (Fernandez) Montero...Attended Nuestra Señora la Espanaza in Caracas, Venezuela...Was signed by current Nationals President of Baseball Operations and General Manager Mike Rizzo while he was with Arizona...He and his wife, Vanessa, have two children: Angel and Camilla. Began his third season with the Chicago Cubs, hitting .286 with three doubles, four homers, eight RBI, 11 walks and 12 runs scored in 44 games...Was designated for assignment on June 28 and was acquired by the Toronto Blue Jays on June 28...Appeared in 32 games in his first American League action. Miguel played in 86 games for Chicago, and logged a 3.16 catcher's ERA that ranked third in the majors (min. 50 games) ... hit .310 (18-for-58) with three doubles, three homers, 12 RBI and a .902 OPS in his final 22 contests starting August 20 ... All told, batted .216 (52-for-241) with eight doubles, eight home runs and 33 RBI in 86 games for Chicago ... Threw out five of 64 baserunners attempting to steal (7.8 percent), including three of his final 13 on the season ... Batted .245 (34-for-139) on the road compared to a .176 average (18-for-102) at home ... Had two walk-off hits: August 29 vs. Pittsburgh (single) and September 16 vs. Milwaukee (homer) ... Batted .250 (19-for-76) with runners in scoring position, 34 points higher than his season average ... Belted a two-run homer on Opening Night in Anaheim to become the first Cubs catcher to go deep in a season opener since Scott Servais in 1996 vs. the Padres ... Tied career high with three runs scored, April 13 vs. Cincinnati ... Landed on the disabled list, April 28 (retroactive to April 25), with lower back tightness ... activated, May 14, after playing in three minor league rehab games with Triple-A Iowa ... Made his first career appearance on the mound, July 3 at the Mets, allowing one run in 1.1 innings in the 14-3 setback ... threw 31 pitches, 19 for strikes ... Played in nine postseason games, batting .167 (2-for-12) with a homer and five RBI ... Hit a two-out, pinch-hit grand slam in the eighth inning of Game One of the NLCS vs. the Dodgers, lifting the Cubs to an 8-4 win ... was first player in major league history to hit a pinch-grand slam that provided the game-winning run in a post-season game. w Additionally, it was the third pinch-slam in post-season history (the Yankees Ricky Ledee at Boston in game 4 of the 1999 ALCS and Cincinnati's Mark Lewis vs. Los Angeles in game 3 of the 1995 NLDS) ... Added a one-out, RBI single in the top of the 10th inning in his lone at-bat of the decisive Game Seven of the World Series. Miguel Montero batted .248 (86-for-347) with 11 doubles, 15 homers and 53 RBI in 113 games for the Cubs, his first campaign in Chicago ... his .754 OPS marked his highest since 2012 with Arizona (.829) ... the backstop hit .301 (22-for-73) from September 1 though season's end. Hit .272 (46-for-169) with eight homers at Wrigley Field ... his home average was 47 points higher than his .225 road average (40-for-178), but he did hit seven homers away from the Friendly Confines. Batted .462 (6-for-13) with one home run and 13 RBI with the bases loaded. Hit .440 (22-for-50) with four homers when putting the first pitch in play. His .754 OPS ranked sixth-best among N.L. catchers with at least 325 at-bats. Threw out 15-of-86 baserunners attempting to steal (17.4 percent) in 110 games behind the plate. Recorded his fifth-career multi-homer effort, April 18 vs. the Padres ... the two blasts accounted for the first of his season, and was his first two-homer game since August 14, 2010 at the Nationals. Belted his 100th career home run, April 26 in Cincinnati, a solo homer in the second inning off Anthony DeSclafani. w That began a 16-game stretch in which he batted .413 (19-for-46) with two homers, eight RBI, 11 walks and a 1.121 OPS through May 17. Drew a walk in nine-straight games with a plate appearance, May 3-13 ... first Cub to turn the trick since Gary Matthews, Jr., in 2001. Was on the shelf with a left thumb sprain, July 12-August 7. Hit a grand slam in his 1,000th career game played, September 6 vs. Arizona ... hit the slam off Matt Reynolds. Hit .095 (2-for-21) with a RBI and four walks in eight post-season games. Miguel was named to the N.L. All-Star team for the second time in his career, and he reached the double-digit home run mark for the fourth-straight season in his final campaign with the Diamondbacks ... hit .243 (119-for-489) with 23 doubles, 13 homers and 72 RBI in 136 games...Named to the N.L. All-Star squad as an injury replacement for Yadier Molina...Among all catchers, ranked second in RBI, third in games caught (131) and innings played (1,152.0 IP), fourth in walks (56), sixth in total bases (181) and tied for sixth in doubles...Became the only catcher to log at least 1,000.0 innings in each of the last four seasons, also extending his club record...Tied for fourth in the N.L. with a career-high 11 intentional walks (also Ruben Tejada)...Threw out 20 of 84 (23.8 percent) baserunners attempting to steal … up from nine in 2013...Made his fifth-career Opening Day start, extending his club record...Tied his career high with three walks, April 1 vs. San Francisco...Hit his first career walk-off home run in the 10th inning, April 30 vs. Colorado (off Tommy Kahnle)...Drove in a career-high six runs and went 3-for-4, June 4 at Colorado...Homered in a career-high three-straight games from June 4-7...Traded to the Cubs, December 9, for minor league right-handed pitchers Jeferson Mejia and Zack Godley. Played in 116 games in his eighth season with the Dbacks, hitting .230 (95-for-413) with 14 doubles, 11 home runs and 42 RBI…Selected by the Arizona Chapter of the BBWAA as the D-backs' Good Guy Award winner…Reached the 1,000.0-innings caught mark for the third straight season, the first player in D-backs history to do so…1,006.2 IC ranked fifth in the NL…Set a club record for catchers with his fifth season of at least 10 home runs, breaking a tie with Damian Miller (4)…Established a club record with fourth career Opening Day start at catcher on April 1 vs. Cardinals…Reached base safely in 21 straight games from May 17-June 12, his second-longest streak of his career (25 from Aug. 13-Sept. 14, 2011)… On 15-day disabled list from July 29-Aug. 26 with a strained lower back, including 6 rehab games with Rookie AZL D-backs…Underwent surgery to clean out an infected left index finger on Oct. 6 in Phoenix (performed by Dr. Sheridan)…Hit .286 (2-for-7) with 1 RBI in 3 World Baseball Classic games with Venezuela. Set career highs in on-base percentage (.391), OPS (.829),walks (73), RBI (88) and games played (141) in his seventh season with the D-backs...hit .286 (139-for-486)with 25 doubles and 15 home runs...Agreed on a 5-year contract extension on May 26...Tied for fourth in the NL in average with RISP/2 outs(.360), ranked fifth in OBP, seventh in average with RISP(.345) and walks...Led all Major League catchers in RBI and innings caught(1,190.0)...was a finalist for the NL RawlingsGoldGlove Award...Ranked among NL catchers in OBP (3rd, .390), doubles(4th), average (4th), OPS (5th), slugging percentage (5th,.439) and home runs (T-5th)...Was the first player in club history with at least 1,000.0 ICin consecutive seasons...Made a franchise-record 130 starts at catcher and threwout 34.3 percent (23-for-67) of attempted basestealers,third-best in the NL behind Yadier Molina (45.7) andRyan Hanigan (43.4)...the 34.3 percent ranks third inclub history, trailing his own 2011 record (36.8) and Damian Miller in 2002 (35.9)...88 RBI were a club record by a catcher, breaking ownmark set in 2011 (86)...Made third career Opening Day start at catcher, tying Damian Miller and Chris Snyder for the club record...Became the 23rd player in club history with 2 hits in aninning on May 7 vs. Cardinals...Established a monthly high with 22 RBI in June and tiedhis monthly best with 6 home runs (also July 2009)...Set a franchise record with his 538th game caught on July25 vs. Rockies, breaking a tie with Chris Snyder (537)...Fourth player in club history to reach base safely 5 timesin a 9-inning game with only 1 hit on Sept. 14 vs. Giants,joining Kelly Johnson on June 4, 2010 vs. Rockies, JoseCruz on May 9, 2005 vs. Nationals and Jay Bell on June29, 1999 at Reds...Started a club-record 20 straight games at catcher fromAug. 30-Sept. 22...Hit .307 (96-for-313) with a .414 on-base percentage overhis final 93 games (.249/.348 on June 9)...Agreed to a 5-year contract extension on May 26. Established career highs in virtually all offensive categories while being named to his first National League All-Star Team, hitting .282 (139-for-493) with 36 doubles, 18 home runs and 86 RBI in 140 games...Finished third in the NL Rawlings' Gold Glove Award balloting as catcher, and received 1 ninth-place vote (T21st) in the Most Valuable Player polling...Garnered the Good Guy Award from the Arizona chapter of the BBWAA for his leadership skills on and off the field...Was the first catcher to hit at least .280 with 30 doubles, 10 homers and 80 RBI in a season since the Braves' Brian McCann in 2009...Ranked among all NL catchers in slugging percentage (1st, .471), doubles (1st), extra-base hits (1st, 55), RBI (1st), hits (1st), total bases (1st, 229), average (2nd) and home runs (2nd)...Made a franchise-record 130 starts at catcher and led the NL by throwing out 47.7 percent (28-of-60) of attempted base stealers, the best mark in club history...Set single-season club records by a catcher with 36 doubles, 18 homers, 55 extra-base hits and 84 RBI...his 9 home runs at the All-Star Break were 1 shy of the club record by a catcher (10, Chris Snyder in 2010)...Made his second straight Opening Day start on April 1 @ Rockies, going 3-for-5 with a double and 2-run homer...his his 7 total bases tied for the third-highest total by a D-back in the season opener...Hit safely in a career-high 18 straight games from Aug. 20-Sept. 10 (.352, 25-for-71), the longest streak by a D-backs catcher in club history...Collected a career-high-tying 3 doubles on June 13 @ Marlins, the fourth time a D-backs catcher accomplished the feat: Montero on Aug. 10, 2009 vs. Mets, Chad Moeller on July 11, 2003 vs. Giants and Johnny Estrada on May 6, 2006 vs. Reds...Appeared as a defensive replacement in the ninth inning of the All-Star Game on July 12 at Chase Field...Tied his career high with 5 RBI on May 30 vs. Marlins and July 23 vs. Rockies...Reached base in 15 straight games from July 20-Aug. 5 (.250, 13-for-52)...POSTSEASON: Hit .300 (6-for-20) with 2 doubles and 2 RBI in the NLDS vs. Brewers. Opened the season for the first time in his career as the D-backs' starting catcher but battled back from early season knee surgery to post offensive numbers that ranked among the top-half of NL backstops...batted .266 (79-for-297)with 9 home runs, 20 doubles and 43 RBI in 85 games for the D-backs...Committed a career-low 2 errors in 522 total chances during 79 games to post a .996 fielding percentage, which tiedfor tops in the Majors among catchers with a minimum of 75 games with the Rockies' Yorvit Torrealba, Twins' JoeMauer and Dodgers' Rod Barajas...had a career-high 6 passed balls...Threw out 16 of 63 basestealers (25.4%)...twice threw out 2 basestealers in a game on July 4 vs. Dodgers and July 18@ Dodgers, marking only the fifth and sixth times in his career he accomplished the feat...Had a trio of 2-hit games to start the season before suffering a torn meniscus in his right knee while running to firstbase on April 10 vs. Pirates...was placed on the 15-day disabled list the next day and underwent surgery on April 15to repair the meniscus tear...team physician Dr. Michael Lee performed the surgery in Phoenix...Was reinstated to the roster on June 12 after missing 57 games and proceeded to reach base safely via a hit or walkin 18 of his next 20 games while batting .342 (25-for-73) with 6 doubles, 2 homers and 10 RBI...stretch included aseason-high 9-game hitting streak (.417, 15-for-36) from June 13-23, which tied for the second-longest streak of hiscareer...Homered in consecutive games for the fourth time in his career on July 29 @ Phillies and July 30 @ Mets...Hit the second of four consecutive homers to tie the Major League record for the seventh time on Aug. 11 @ Brewers...his homer was preceded by Adam LaRoche and followed by Mark Reynolds and Stephen Drew...Had his fourth career 2-homer game on Aug. 14 @ Nationals, becoming the only Major League catcher to hit 2 homeruns in a game in each of the last four seasons...joined Rays' Kelly Shoppach and Angels' Bobby Wilson to becomethird trio of catchers to have multi-homer games on the same day...was also accomplished on July 26, 1997 by BenitoSantiago, Mike Piazza and Javy Lopez and on May 8, 1999 by Mike Lieberthal, Santiago and Charles Johnson...Hit 2 triples to tie the Major League single-game record for a catcher in final home game on Sept. 26 vs. Dodgers,becoming 24th catcher since the expansion era began in 1961 to accomplish the feat and first since the Royals' JohnBuck on April 30, 2009 vs. Blue Jays. Established himself as one of the best catchers in baseball after assuming the starting catching duties in late-June and subsequently enjoyed a breakout campaign, highlighted by career bests with a .294 batting average, 128 games, 425 at-bats, 61 runs scored, 125 hits, 30 doubles, 16 home runs, 59 RBI, 38 walks, a .355 on-base percentage and a .478 slugging percentage...Among big league catchers (min. 450 plate appearances), ranked fourth in batting average, on-base percentage, slugging percentage and a .832 OPS; tied for fourth in doubles; tied for fifth with 46 extra-base hits; sixth in runs scored; tied for eighth with 30 multi-hit games; ninth in 125 hits and RBI; tied for ninth in home runs...Hit .329 (27-for-87) against southpaws and .286 (98-for-343) versus right-handed pitchers...his average against lefties was second-best on the team behind Justin Upton (min. 75 plate appearances)...Batted .305 (60-for-197) in 62 games at Chase Field and .285 (65-for-228) in 66 road contests...Hit .301 (55-for-183) with a .375 on-base percentage and .486 slugging percentage in 56 games against NL West foes...In 111 games at catcher, including 101 starts, nabbed 34 of 166 attempted basestealers (20.5%)...His 4.10 catcher's ERA ranked 10th among all big league backstops and logged 924.2 innings behind the dish, 12th-most in the Majors...Had a career-high 4 hits on June 7 @ Padres (an 18-inning game) and July 18 @ Cardinals...Had a season-high 3 RBI on April 20 vs. Rockies, July 22 @ Rockies, Aug. 29 vs. Astros and Sept. 29 @ Giants...Hit the front end of back-to-back home runs with Dan Haren on June 30 @ Reds, the first such homers by a catcher and pitcher since the Braves' Brian McCann and Jorge Sosa in 2006...Collected his first career stolen base on June 18 @ Royals, swiping second base as part of a double-steal with Chris Young in the third inning...Posted a .417 average (15-for-36) during a 9-game road hitting streak from July 2-31 with a .447 on-base percentage and .917 slugging percentage.Had a pair of 9-game hitting streaks from July 17-26, batting .444 (16-for-36), and Aug. 9-20, hitting .419 (13-for-31)...In July, led all catchers with a .640 slugging percentage and ranked seventh in the Majors with a 1.006 OPS...Had a career-high 3 doubles on Aug. 10 vs. Mets, matching the franchise record for the 17th time...Batted .500 (21-for-42) during a 12-game home hitting streak, boasting a .553 on-base percentage and .905 slugging percentage while collecting an RBI in each of the first 7 games (11 RBI)...Had a career-high 10-game hitting streak from Aug. 26-Sept. 5, batting .351 (13-for-37)...Had his third career 2-home game on Sept. 29 @ Giants...Following the season, played for Navegantes del Magallanes in the Venezuelan Winter League...in 14 games, hit .255 (13-for-51) with 8 doubles and 6 RBI. Appeared in 53 games at catcher, including 45 starts, in serving as the backup catcher forthe second consecutive season...Began the season on the disabled list with a fractured right finger...saw action in 11 games for Tucson (AAA) during a rehab assignment prior to making season debut with the Dbackson April 23 at Los Angeles Dodgers...Tied a career-high by collecting 3 hits in a game on 3 occasions; April 30 vs. Houston,July 11 at Philadelphia and Aug. 16 at Houston...Hit game-winning sacrifice fly in 10th inning on June 12 at New York Mets...Hit safely in 7 of 8 games from July 28-Aug. 23, batting .481 (13-for-27) over that stretchwith 9 runs scored, 4 doubles, 4 home runs and 8 RBI...Hit his first career grand slam off of Astros' pitcher Brandon Backe on Aug. 16 at Houston...also hit a solo homer to set a career-best with 5 RBI...marked his second careergame with 2 homers, also accomplished on Sept. 5, 2007 vs. San Diego...Backe also gaveup a grand slam to Chris Young, marking the first time 2 D-backs hit grand slams in thesame game...Hit his first career triple on Aug. 27 at San Diego. Broke camp on the 25-man roster for the first time in his 6-year professional career...Hit his first home run on April 14 vs. Colorado, a solo shot in the eighth inning...Hit his first pinch-hit home run on April 25 vs. San Diego, a solo shot in the eighth inning off Scott Linebrink...connected for his second pinch-hit home run on June 5 vs. San Francisco, followed shortly by another pinch-hit home run on June 8 vs. Boston...His 3 pinch-hit home runs tied for third place on the D-backs' all-time single season list with Tony Clark in 2005 & 2007, Greg Colbrunn in 2001 and Alex Cintron in 2005...it took 9 at-bats as a pinch-hitter to reach 3 home runs, the fastest of any player in D-backs history (16 at-bats for Tony Clark in 2007, 32 at-bats for Colbrunn in 2001, 44 at-bats for Clark in 2005 and 46 at-bats for Cintron in 2005)...Tied his career-high with 3 hits on June 20 vs. Tampa Bay, ending the day 3-for-4 with 2 runs scored...Hit a go-ahead home run in the top of the 10th inning at San Francisco on June 29, propelling the D-backs to the win...Over 12 games from June 20-July 14, he hit .350 (14-for-40) with a double, 2 home runs, 7 RBI and 6 runs scored...Had a career-high 3 RBI on Aug. 31 vs. Colorado, connecting for his eighth home run of the season...8 of his 10 home runs were hit in the sixth inning or later (1 in the 10th, 3 in the eighth, 2 in the seventh and 2 in the sixth)...Hit 2 home runs on Sept. 5 against San Diego, his first career multi-homer run game, going deep off Jake Peavy in the fourth inning and then blasted a solo shot off Brett Tomko in the seventh...Hit a home run every 21.40 at-bats (10 home runs in 230 at-bats), ranking fourth on the team (Tony Clark, 13.00, Micah Owings, 15.00, and Chris Young, 17.78)...Was 7-for-20 with 1 double, 3 home runs 7 RBI and 5 runs scored as a pinch-hitter this season...Held a .984 fielding percentage over 73 games (510.2 innings) at catcher for the D-backs. 2007 Postseason highlights: Saw action in 1 NLDS game vs. Chicago, going 0-for-2 with a walk...played in 3 NLCS games against Colorado, batting .400 (2-for-5). Combined to hit .286 (121-for-423) with 23 doubles, 17 home runs and 75 RBI in 117 games with Double-A Tennessee and Tucson...Was recalled on Sept. 1 and made his Major League debut on Sept. 6 @ Marlins (0-for-3)...Collected his first hit on Sept. 25 @ Giants (single off Jason Schmidt) and was 3-for-4 with a double and 2 RBI...Played with Aragua in the VWL...Entered the season ranked by Baseball America as the fifth-best prospect in the D-backs' organization. Batted .326 (151-for-463) with 25 doubles, 26 homers and 95 RBI with Single-A Lancaster and Tennessee...Ranked among the California League leaders in batting average (1st, .349), slugging percentage (3rd, .625) and home runs (6th, 24)...Named to the CL midseason All-Star Team...Played for the World Team at the MLB All-Star Futures Game on July 10 in Detroit (0-for-1 with 2 walks)...Played 6 games with Phoenix in the Arizona Fall League and hit .421 with 2 homers and 9 RBI...Appeared in 49 games with Occidente in the VWL, batting .284 with 10 doubles, 6 homers and 22 RBI. Spent the entire season with Single-A South Bend, hitting .263 (106-for-403) with 22 doubles, 11 home runs and 59 RBI in 115 games...Played with Occidente in the VWL. Played in his second straight season with Rookie Missoula and batted .301 (59-for-196) with 10 doubles, 4 home runs and 32 RBI...Played with Occidente in the VWL. Hit .263 (40-for-152) with 10 doubles, 3 home runs and 14 RBI in 50 games with Missoula. Made his professional debut with the Dominican Summer League D-backs. April 13, 2018 C Miguel Montero elected free agency. April 13, 2018 Washington Nationals sent C Miguel Montero outright to Syracuse Chiefs. April 11, 2018 Washington Nationals designated C Miguel Montero for assignment. April 10, 2018 Washington Nationals activated C Miguel Montero from the paternity list. April 7, 2018 Washington Nationals placed C Miguel Montero on the paternity list. March 27, 2018 Washington Nationals selected the contract of C Miguel Montero from Syracuse Chiefs. February 13, 2018 C Miguel Montero assigned to Syracuse Chiefs. February 1, 2018 Washington Nationals signed free agent C Miguel Montero to a minor league contract and invited him to spring training. November 2, 2017 C Miguel Montero elected free agency. August 16, 2017 Toronto Blue Jays activated C Miguel Montero from the 10-day disabled list. August 15, 2017 Toronto Blue Jays sent C Miguel Montero on a rehab assignment to Buffalo Bisons. August 4, 2017 Toronto Blue Jays placed C Miguel Montero on the 10-day disabled list retroactive to August 3, 2017. Strained groin. July 4, 2017 Toronto Blue Jays activated C Miguel Montero. July 3, 2017 Chicago Cubs traded C Miguel Montero to Toronto Blue Jays for Player To Be Named Later. June 28, 2017 Chicago Cubs designated C Miguel Montero for assignment. May 14, 2016 Chicago Cubs activated C Miguel Montero from the 15-day disabled list. May 10, 2016 Chicago Cubs sent C Miguel Montero on a rehab assignment to Iowa Cubs. April 28, 2016 Chicago Cubs placed C Miguel Montero on the 15-day disabled list retroactive to April 25, 2016. Lower back tightness. August 7, 2015 Chicago Cubs activated C Miguel Montero from the 15-day disabled list. August 2, 2015 Chicago Cubs sent C Miguel Montero on a rehab assignment to Tennessee Smokies. October 7, 2014 C Miguel Montero assigned to Navegantes del Magallanes. August 26, 2013 Arizona Diamondbacks activated C Miguel Montero from the 15-day disabled list. August 17, 2013 Arizona Diamondbacks sent C Miguel Montero on a rehab assignment to AZL D-backs. June 12, 2010 Miguel Montero roster status changed by Arizona Diamondbacks. June 12, 2010 Arizona Diamondbacks activated C Miguel Montero from the 15-day disabled list. June 7, 2010 Arizona Diamondbacks sent C Miguel Montero on a rehab assignment to Reno Aces. November 22, 2009 Navegantes del Magallanes traded 3B Balbino Fuenmayor and RHP Ramon A. Ramirez to Caribes de Anzoategui for C Miguel Montero. October 9, 2009 Miguel Montero assigned to Caribes de Anzoategui.